Well, the boy & I finally made it back to Cleveland. Sorry about the delay but the drive took its toll on me & I really needed to chill out for a few days. It's nice to be home although chaos is about to happen because my parent's decided that they wanted an exchange student from Poland (who doesn't speak English) to come live with them for four months. I think we may start staying at Amanda's house or even Jon's parents houe. Jon has been pretty non exsistent in my life, I have barely talked to him since I left, plus we are having issues about this bachelor party & the involvement of strippers. I think it is ridiculous and he says it is tradition. I think that it is the most awful tradition ever. I just don't understand. Here you are getting married but two days before you are letting some other b*$tch put her body all over yours. I am pretty sure Jon would not want me to have some guy all over me. Plus strip clubs are sooo seedy, I know I used to hang out at them in college. My friend worked there and my roomate and I used to go get drunk for free there. Anyways I am rambling...The whole point is Jon is being retarded. Plus when I let him got to Vegas last year when I was pregnant for a bachelor party we agreed that there would be no strippers. Way to stick to that agreement, guy! 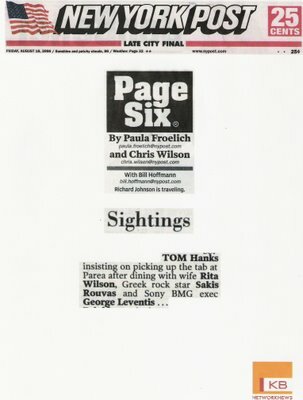 In other chef's widow news, Jon's restaurant was in the New York Post on Page Six for having Tom Hanks hang there. You know you have made it when Forrest Gump eats in your restaurant.